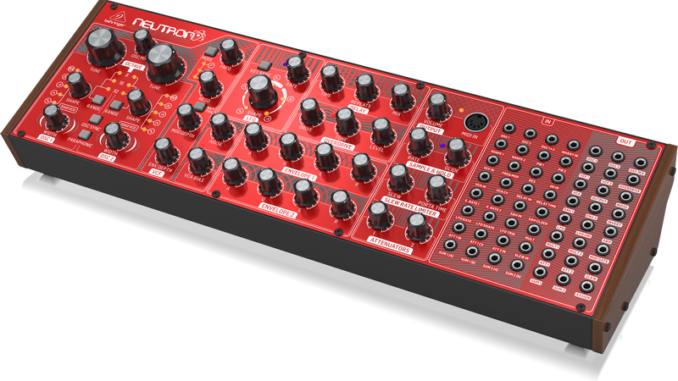 News: Behringer Neutron Firmware 2.0 Update Released! 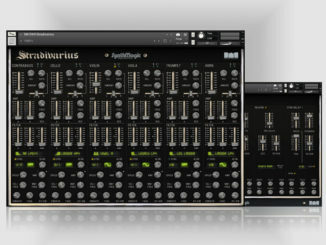 HomeNewsHardwareBehringer Released Neutron Firmware Update 2.0: Control App & Many New Features! Behringer Neutron Firmware Update 2.0 features many new features (LFO one-shot, re-trigger…), improvements and a brand new control app! Big news coming from Behringer but this time it’s not a new product announcement. 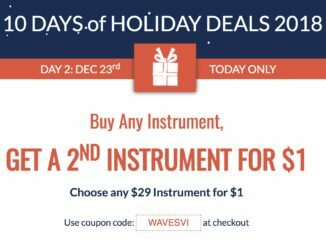 After they have already released an update for the Model D, there is now a big 2.0 firmware update for Neutron Synthesizer (Bestseller 2018?). The new update features a brand-new application that allows you to change different configurations very quickly. 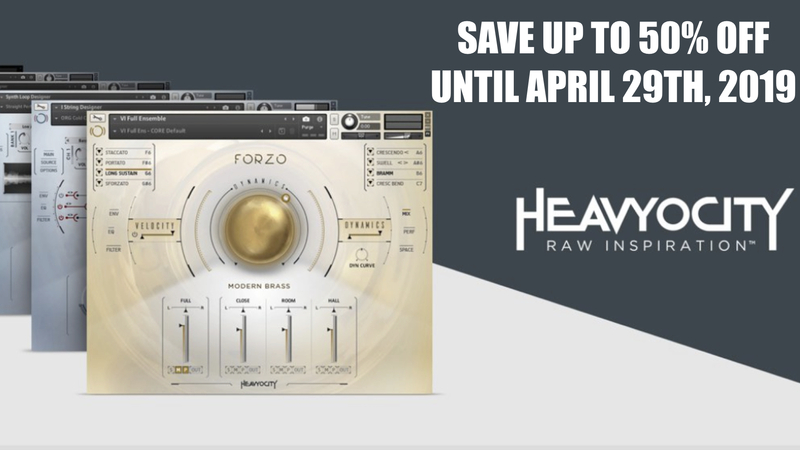 Beside the app, the developers added a big amount of new features to the internal LFO (one shot mode, re-trigger…), filter improvements and much more. 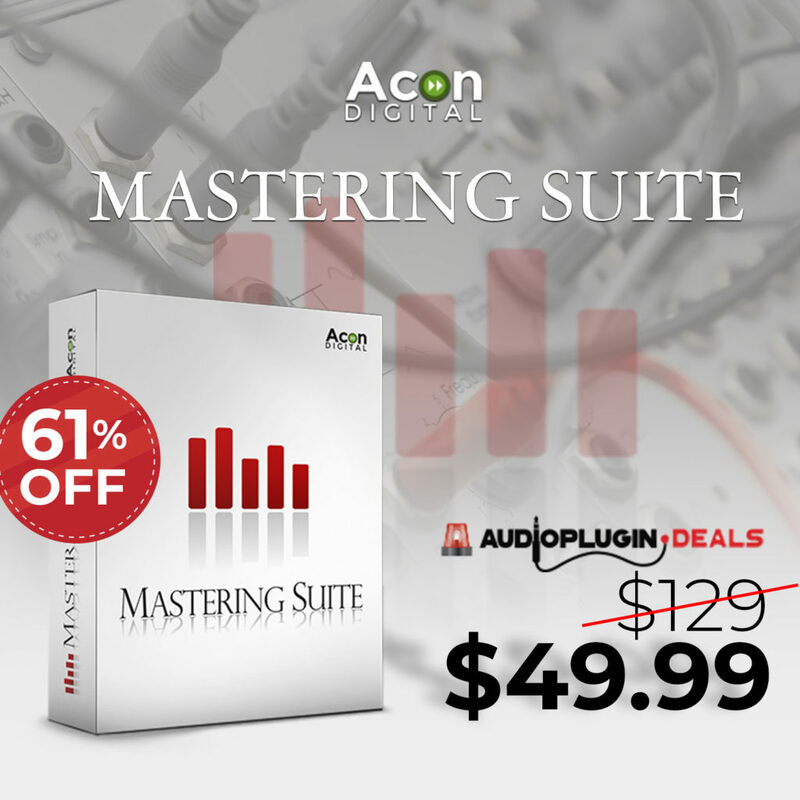 This update is free of charges and improves in my opinion very good the Neutron. Well done Behringer team and a nice gift for existing customers! Added full support for the Neutron Application. For more details please see the updated User Manual. Added Restore Default Parameters button combination. Added LFO One Shot mode. Added LFO Re-trigger option for overlapping notes. Added LFO rate Key Track – The LFO rate will double or halve for each octave played above or below a user defined note. Added LFO Shape re-ordering – Any of the LFO shapes can be placed in any of the 5 available locations, including duplicate shapes. Added LFO Phase offset – Each LFO slot can have an independently set phase offset (configurable to 0, 45, 90, 135, 180, 225, 270 or 315 degrees). Added the ability to set the maximum LFO Depth between 0-100%. The VCF in key track mode will track with porta & pitch bend. Added an internal VCF mod source with the following options: Disabled, After Touch, Mod Wheel and Note On Velocity). Added independent Auto Glide options for each oscillator. The user can set an auto glide range of up to +12/-12 semitones. The rate of auto glide is defined by the Porta time control. Added configurable pitch bend range between 0-24 semitones (The same value is used for both +’ve and -‘ve pitch bend ranges). Added note priority options of High, Low and Last note. Implemented Oscillator keyboard split for Oscillator 1 and 2. Oscillator 1 plays below the split point and oscillator 2 plays above the split point (Also dependent on note priority). Added the ability to configure a maximum and minimum note numbers. This limits the MIDI notes that the Neutron will respond to. Added the ability to Mute out of range notes. Implemented SysEx commands for all configurable settings, including MIDI Channel selection. OSC 2 can now be configured to ignore incoming MIDI notes. Improved filter tracking when key track (KEY TRK) is enabled. Assign Out (Note Velocity) CV is now held after a Note Off message is received. The Neutron app is designed to control the Neutron’s complex features in an easy to use format. 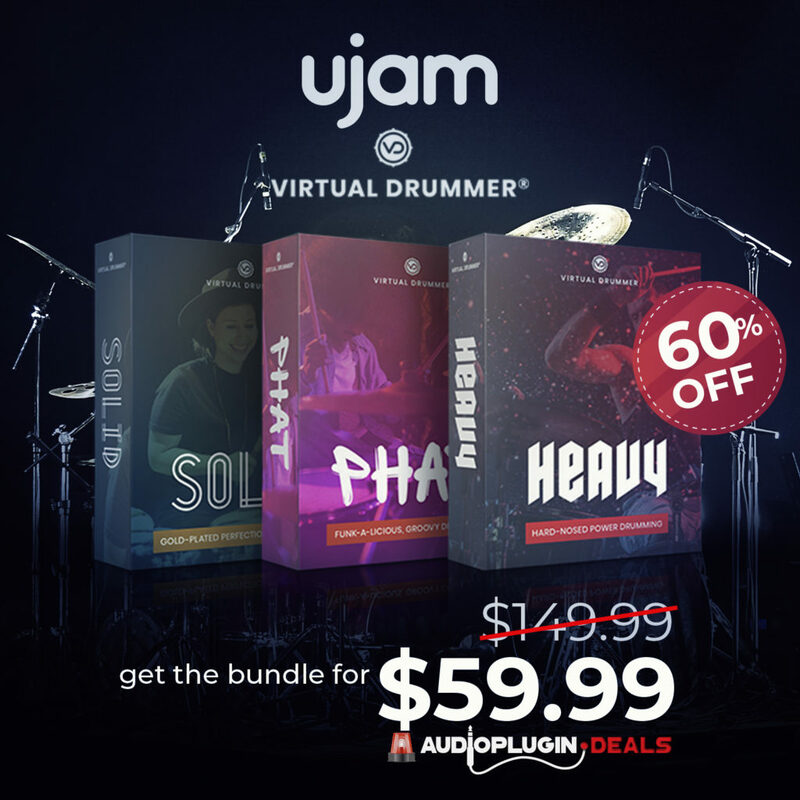 To use the app, simply download the latest version from the www.musictribe.com website and follow the installation instructions. Any Neutron will need to be updated to version V2.0.0 or higher in order for the Neutron to be recognised in the App. 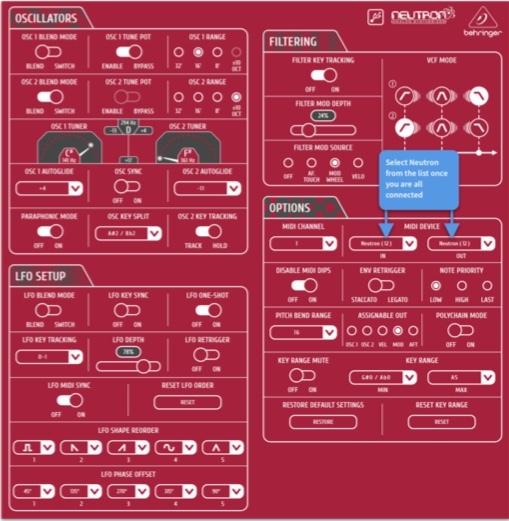 Once your Mac or PC is connected via USB, open the app, set-up and enjoy easy control of many parameters of the Neutron Synthesizer as described earlier in this manual. 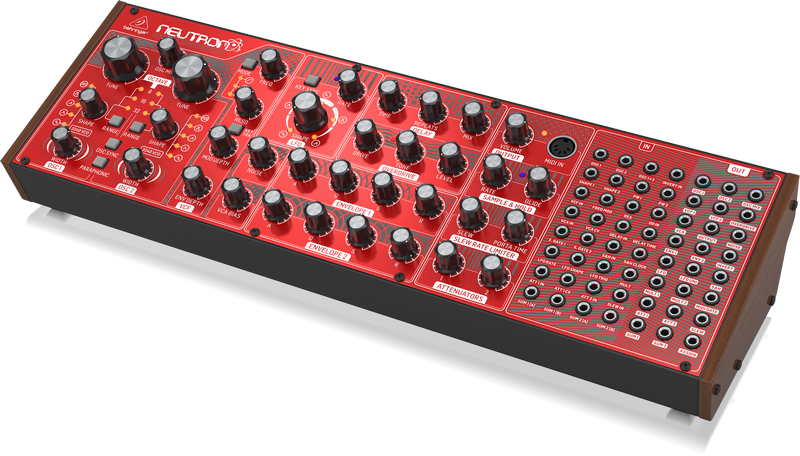 Behringer Neutron Firmware Update 2.0 is available now free of charge. 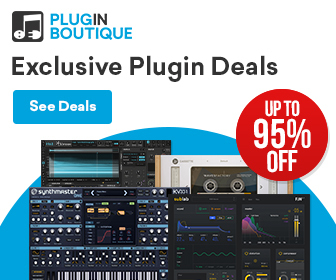 Neutron Synthesizer is available now worldwide for 299$/€. Synapse Audio’s New DUNE 3 Synthesizer Features A Wavetable Editor, Dual Filter & More! 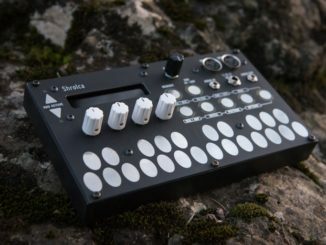 Shrolca Is A Shruthi Synthesizer In Volca Size With A Touch Plate Keyboard & Now On Kickstarter!